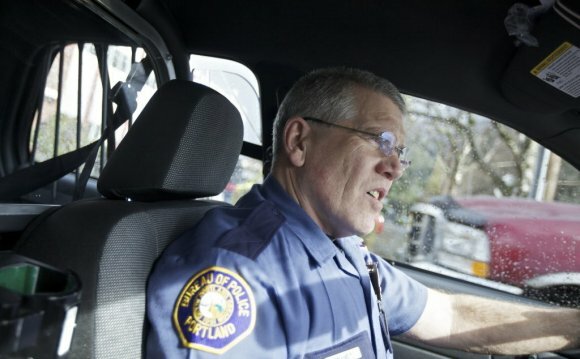 The Portland rent-a-cops patrolling downtown look like real cops. They have similar uniforms, and many carry real guns. They share some of the same duties. In fact, they could easily be—and often are—mistaken for police officers by the average person on the street. There is one critical difference, however. Unlike the real cops, they're only accountable to one person, and he refuses to answer questions. Portland Patrol, Inc. (PPI) is the downtown private security firm that has a contract with the Portland Business Alliance (PBA) to do "order maintenance" in the city's downtown core. Because the firm is a private business, rather than a public body, it currently doesn't have to answer any questions from the public regarding its activities. Despite this, PPI is being given increasing responsibility, and many are becoming concerned that, without more accountability, serious problems could result. According to our research, there are roughly 17 armed and 13 unarmed PPI officers walking Portland's streets. PPI has refused to confirm these numbers with the Mercury, let alone explain under what circumstances a PPI officer might be allowed to pull their gun. No one has been shot yet, and it may never happen—PPI officers are charged with solving "order maintenance problems" using the lowest possible impact, and if situations have the potential to escalate, they are supposed to call the real police. But if this is the case, why are PPI's officers allowed to carry guns? Budget and hiring shortfalls mean that the city's cops—there are 91 full-time police officers currently assigned to the bureau's Central Precinct—rely on PPI to be their "eyes and ears, " in the words of Central Precinct Commander Mike Reese. PPI and police leadership meet regularly, and since January, PPI officers have been handing out laminated cards to downtown businesses, urging them to call PPI with regard to "homeless persons, " "panhandling, " and the "mentally ill."
In other words, PPI officers are often downtown's first respondents when it comes to interacting with the homeless or other people on the street, and they work closely with the police bureau. Four of PPI's officers are actually "embedded" police officers with the power to make arrests—one of whom was photographed in March outside Pioneer Place, with his hand apparently around the neck of a street kid ["Choked Up, " News, March 1]. PPI's embedded officers, like Portland's actual cops, are subject to oversight by the Portland Police Bureau's Internal Affairs Division and the Independent Police Review, which is in turn overseen by the Citizen Review Committee. However, there's only one person with whom citizens can lodge a complaint, if they were to have an unfortunate run-in with the rest of PPI—and that's PPI's chief executive, John Hren. But as owner of the company, investigating his own complaints presents an obvious conflict of interest. Because he operates a private business, Hren refutes the idea that he should have to answer questions from the press about PPI's complaints-handling procedures, training, contracts, or any other aspect of the firm's activities. Likewise, the PBA have not only refused to answer, but have repeatedly stonewalled the 's questions regarding details of its contract with PPI. Carmen Rubio, a spokesperson for the mayor, says Potter is too "insufficiently informed about the contract to be able to comment." Meanwhile, the city's existing 10-year contract with the PBA to provide extra downtown security through PPI runs out on October 22 this year. "This is a prime example of how a lack of transparency works against the public interest, " says Alejandro Queral of the Northwest Constitutional Rights Center (NWCRC). "You have ordinary citizens dressed up like cops, with real guns but fake badges. An ordinary person who perceives these rent-a-cops to be the real deal may be at risk of having his or her rights violated without any way to hold the individual accountable." With the mayor's Street Access for Everyone committee about to pass a controversial sit-lie ordinance, homeless and civil rights activists are growing more and more curious about PPI. That's because its officers, who already have the power to issue park exclusions as part of a city contract to patrol 11 of its parks, will also soon be able to give verbal warnings to those sitting or lying on downtown's sidewalks. "Most of the time, it will be the private security forces that will engage the people on the streets, " says Street Roots Managing Editor Joanne Zuhl. "It's time for the city to engage in their oversight." "They [PPI officers] are hired by a special interest group [the PBA] interested in making downtown attractive for consumers, " adds Andrea Meyer, legislative director for Oregon's chapter of the American Civil Liberties Union. "Giving them tools to enforce Portland ordinances creates a powerful conflict of interest, " she continues. "They may conclude that having homeless folks in the downtown area is a detraction and will affect businesses, giving justification to move homeless out of the downtown area." Thanks to an inefficient background checking operation at the state level—which can take up to six months to check new PPI officers' fingerprints against federal and state criminal databases—there are also questions about what kind of person is allowed to become a PPI officer. PPI's unarmed officers, in particular, go through a much more lax background-checking process than their armed counterparts or potential cops. Unlike the police, who have to wait up to a year for their background checks to clear before they can start training—let alone wear a uniform and patrol the streets—unarmed PPI officers are able to start work immediately on a trust-based "temporary work permit" issued by the Oregon Department of Public Safety Standards and Training (DPSST), while its four-to-six month background checks go through. A Police Support Unit or PSU is a unit of police officers who have undergone specialist training in public order policing.